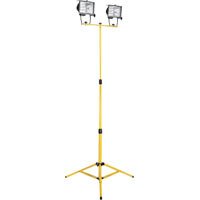 Telescoping double reinforced tripod stand with twin powerful 500 watt work lights. High quality on/off switch, tempered glass, extra depth wire guard and 12' power cord with grounded plug. Two 500 watt lamps supplied (130 volt for extended life).